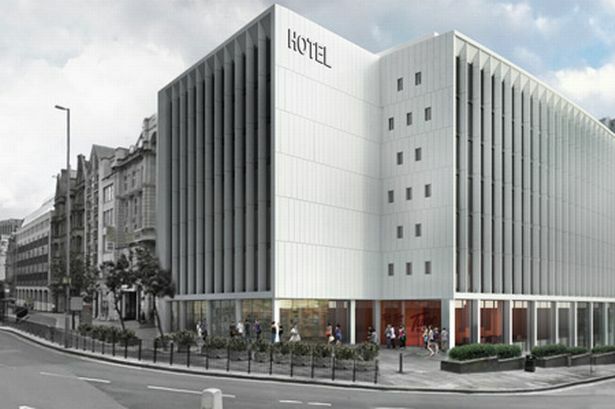 The city’s first ever pre-cast concrete building – built more than 40 years ago – is to be transformed into a hotel, restaurant and apartments. Planning permission has been granted for a £16 million scheme at the former HSBC building in Paradise Street – currently home to Snobs nightclub – which will create 100 new jobs, including at least 50 for young, unemployed people. Known as the Beneficial Building, the seven-storey site was the first pre-cast concrete building in Birmingham but has been largely vacant for years after its owners fell into administration in 2008. Now work will begin in spring to transform the building into a new 137-bedroom hotel, 53 serviced apartments and a new café/restaurant created. The building is currently surrounded by scaffolding to protect people from unsafe cladding panels, some of which have fallen off. The scheme is the first for developer Anthony McCourt of Court Collaboration since leaving his post at The Cube last year. Mr McCourt, 30, told the Post he has initial agreements with hotel/apartment operators and a new café and restaurant – although they were still being finalised – and he is also in talks with the managers of Snobs, Athens Greek restaurant and take-away Top Nosh about the future of the building. “This is a 100 per cent pre-let development. In the end it will create 100 jobs – half of which will be young, unemployed people – not to mention the construction jobs along the way,” he added. Originally the quarters of HSBC bank in Birmingham, the building was more recently let as mixed offices with a number of professional service firms. Mr McCourt said its proximity to the Colmore Row business area and the shopping districts of The Mailbox and the soon-to-be John Lewis store, makes it an ideal opportunity for redevelopment. The plans have been drawn up by Glenn Howells Architects. Director Davinder Bansal said: “We are excited to be a part of this project which will bring back to life a 60s piece of quality architecture, so close to Paradise Circus and the proposed metro extension line. The Beneficial Building was once an aesthetically beautiful building and we are delighted that the developer proposes to reinstate it to its former glory and remove the jaded metal cladding. Mr McCourt said he was unable to reveal the new occupants expected to sign up but said he was pleased with the calibre of new business interested. He added: “It was the very first pre-cast concrete building in Birmingham, it is across the road from Paradise Circus and a couple of hundred metres from the new John Lewis store.